Brees agreed to restructure his contract, Tom Pelissero of NFL.com reports. Analysis: The move clears up $10.8 million in cap room as the Saints attempt to re-sign backup quarterback Teddy Bridgewater and add tight end Jared Cook. Kicking the can down the road with Brees' contract is an annual tradition, with the team presumably resigned to taking a large dead cap charge whenever the 40-year-old quarterback retires. Brees won't have Mark Ingram (Ravens) by his side in 2019, but the addition of Cook would more than make up for the loss in terms of pass-game value. Brees plans to continue his football career, Mike Triplett of ESPN.com reports. 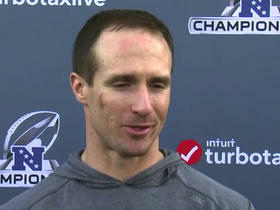 "I feel pretty positive," Brees said Sunday. "I plan on being here next year and making another run at it." Brees completed 26 of 40 passes for 249 yards with two touchdowns and one interception in the Saints' 26-24 overtime loss to the Rams in Sunday's NFC Championship Game. He also lost two yards on two rushes. Brees completed 28 of 38 passes for 301 yards with two touchdowns and an interception during the Saints' 20-14 divisional-round playoff win over the Eagles on Sunday. He also netted zero yards on three rushes and fumbled twice, recovering one himself. Brees (coach's decision) is inactive for Sunday's game against the Panthers, John DeShazier of the Saints' official site reports. Analysis: It was revealed a couple days earlier that Brees wouldn't play in Week 17 with the Saints having secured the NFC's No. 1 seed in the postseason, but it wasn't known whether or not he would dress as the backup to fill-in starter Teddy Bridgewater. Brees' place on the inactive list ensures that Taysom Hill will work as Bridgewater's top understudy. Teddy Bridgewater will replace Brees as the starting quarterback for Sunday's game against the Panthers, Josh Katzenstein of The New Orleans Times-Picayune reports. 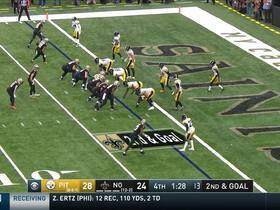 Analysis: Brees led his team to the No. 1 seed in the NFC and can now get some rest before the divisional round of the playoffs. He'll finish a season with less than 4,000 passing yards for the first time as a member of the Saints, but he more than made up for it with 8.2 yards per attempt, 32 touchdowns and only five interceptions, not to mention a new single-season NFL record for completion percentage (74.4). 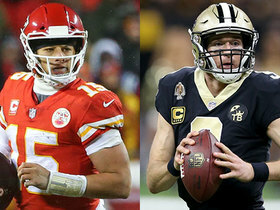 Brees is the only threat to prevent Patrick Mahomes from winning an MVP award. Brees acknowledged Tuesday that there's "no doubt" he'll cede snaps to backup Teddy Bridgewater in the Saints' regular-season finale Sunday against the Panthers, Josh Katzenstein of The New Orleans Times-Picayune reports. Brees completed 27 of 39 attempts, compiling 326 passing yards and one touchdown during Sunday's 31-28 win against the Steelers. 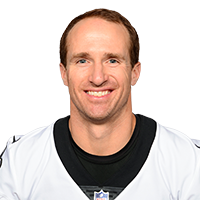 Brees completed 23 of 35 passes for 203 yards and an interception in Monday night's 12-9 win over the Panthers. He also had a two-point conversion attempt intercepted. Brees completed 24 of 31 passes for 201 yards with a touchdown and an interception in the Saints' 28-14 win over the Buccaneers on Sunday. He also lost a yard (but scored a TD) on three carries and lost a fumble. Brees completed 18 of 28 passes for 127 yards with one touchdown and one interception in the Saints' 13-10 loss to the Cowboys on Thursday. He also rushed once for two yards and fumbled once but recovered. Brees completed 15 of 22 attempts for 171 yards, four touchdowns and one interception during Thursday's 31-17 victory over Atlanta. Brees completed 22 of 30 passing attempts for 363 yards and four touchdowns in Sunday's 48-7 victory over the Eagles. Brees completed 22 of 25 passes for 265 yards and three touchdowns and added three yards and a touchdown on two carries during Sunday's 51-14 win over Cincinnati. Brees completed 25 of 36 pass attempts for 346 yards and four touchdowns during Sunday's 45-35 win over the Rams. He also carried four times for 16 yards. Brees completed 18 of 23 passes for 120 yards, a touchdown and an interception in Sunday's 30-20 win over the Vikings. 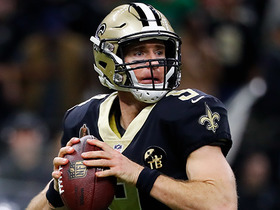 Analysis: Brees was gifted with excellent field position on multiple change of possessions, resulting in season-low passing yardage, despite walking away with a victory. The ageless signal caller completed 78 percent of his passes, which shockingly was only his fifth-best mark through seven games this year. Brees should be far more active Sunday against the Rams, who have a high-octane offense and a secondary that can be exposed at times. Brees connected on 22 of his 30 pass attempts for 212 yards and two touchdowns (the 500th and 501st of his career) during Sunday's 24-23 win over Baltimore. He added three yards on four carries. Brees completed 26 of 29 passes for 363 yards and three touchdowns in Monday night's 43-19 win over the Redskins. Analysis: Brees' performance saw him become the NFL's career leader in passing yards. In spectacular fashion, Brees broke the record on a 62-yard touchdown to rookie Tre'Quan Smith, who would finish the night with two scores. After not throwing a touchdown Week 4, Brees rebounded in a big way Monday, sending the Saints into their bye week on a high note. Brees completed 18 of 32 passes for 217 yards without a touchdown or turnover in Sunday's 33-18 road win over the Giants. Analysis: Brees was nowhere hear his best, failing to throw a touchdown while squandering numerous red-zone opportunities. Still, he methodically led the offense down the field and controlled the clock, helping set up a three-touchdown day for running back Alvin Kamara. Brees has displayed consistently better results at home in the last few seasons, so he should be able to get his mojo back Week 5 with the Saints returning to the Mercedes-Benz Superdome to host the Redskins. Brees completed 39 of 49 passes for 396 yards and three touchdowns while adding three rushes for seven yards and two touchdowns in Sunday's 43-37 overtime win over Atlanta. Brees completed 28 of 35 passes for 243 yards with two touchdowns and no interceptions in the Saints' 21-18 win over the Browns on Sunday. He also lost a yard on his sole rush. Brees completed 37 of 45 passes for 439 yards with three touchdowns and no interceptions in the Saints' 48-40 loss to the Buccaneers on Sunday. He also threw a two-point conversion pass. Brees completed seven of nine passes for 59 yards and one interception during Saturday's preseason game against the Chargers. He also completed a two-point conversion attempt. Brees did not play in Friday's preseason game against the Cardinals. Brees and the Saints have reached agreement on a two-year, $50 million contract that includes $27 million guaranteed, Jane Slater of NFL Network reports. Brees and the Saints are expected to reach agreement on a two-year contract Tuesday, Ian Rapoport of NFL Network reports. Analysis: Brees isn't believed to have any interest in leaving New Orleans, but he nonetheless has some leverage thanks to the structure of his last contract, which would leave the Saints with a dead cap charge of $18 million for 2018 if they don't sign the quarterback to a new deal before free agency opens at 4:00 p.m. EST on Wednesday. All signs point to Brees staying put, even if negotiations have been somewhat tenuous. Brees is still expected to re-sign with the Saints, Herbie Teope of The New Orleans Times-Picayune reports. Though Brees is slated to become an unrestricted free agent in March, when asked following Sunday's divisional-round loss to the Vikings if he considered himself a part of the Saints' future, he replied, "I do," Herbie Teope of The New Orleans Times-Picayune reports. Brees completed 25 of 40 passes for 294 yards, three touchdowns and two interceptions during Sunday's 29-24 NFC divisional-round loss to the Vikings. Brees completed 23 of 33 passes for 376 yards, two touchdowns and an interception in Sunday's 31-26 NFC wild-card win over the Panthers. Brees completed 22 of 30 passes for 245 yards with one touchdown and no interceptions in Sunday's 31-24 loss to the Buccaneers. He also gained two yards on his sole rush. Brees completed 21 of 28 pass attempts for 239 yards, one touchdown and one interception during Sunday's 23-13 win over the Falcons. Brees completed 26 of 36 passes for 285 yards, two touchdowns and an interception during Sunday's 31-19 win over the Jets. Brees completed 26 of 35 passes for 271 yards with two touchdowns and one interception in Thursday's 20-17 loss to the Falcons. He also rushed once for two yards. Brees completed 25 of 34 passes for 269 yards and a touchdown in Sunday's 31-21 win over the Panthers. Brees completed 22 of 32 passes for 246 yards and one touchdown during Sunday's 26-20 loss to the Rams. He added five rushing yards on one carry. Brees completed 29 of 41 passes for 385 yards with two touchdowns and an interception while adding a two-yard carry in Sunday's 34-31 win against the Redskins. 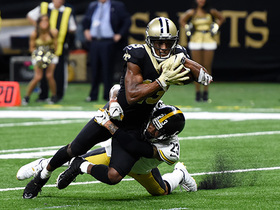 Analysis: Brees was brilliant in this one, leading his team back from a 15-point deficit in the final three minutes of regulation by connecting on touchdown passes of three and 18 yards to Josh Hill and Alvin Kamara, respectively. The veteran quarterback's mere 15 touchdowns in 10 games are a reflection of New Orleans' extremely effective running game rather than any shortcomings on his own part. Brees is still capable of taking over games and putting up top-notch fantasy performances when he has to. Brees completed 18 of 25 pass attempts for 184 yards Sunday against the Bills. He also ran for six yards and a touchdown on two carries. Analysis: Brees simply played the roll of game manager in this one, taking a back seat to a rushing attack that churned out 298 yards on the ground. He got in on the action himself, scoring on a seven-yard scamper in the third quarter that afforded him some semblance of fantasy utility. The emergence of the running game has made Brees a bit more prone to lean weeks of late, but he remains a threat to post big numbers on a game-by-game basis and will continue as such next week against the Redskins. Brees completed 22 of 27 passes for 263 yards with two touchdowns and no interceptions in Sunday's 30-10 win over the Buccaneers. He also gained two yards on four rushes and fumbled once. 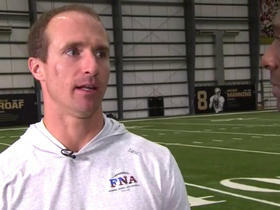 New Orleans Saints quarterback Drew Brees talks with NFL Network's LaDainian Tomlinson and reflects on his career. NFL Network's Cynthia Frelund reveals her game projections for New Orleans Saints quarterback Drew Brees. 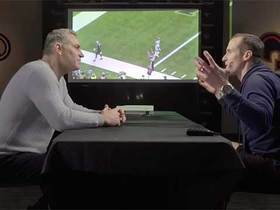 NFL Network's Kurt Warner sits down with New Orleans Saints quarterback Drew Brees to break down film and reflect on Brees' career achievements. New Orleans Saints QB Drew Brees speaks to the media prior to the team's NFC Championship Game against the Los Angeles Rams. 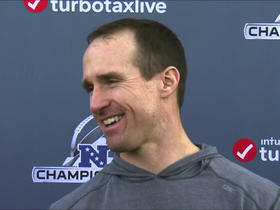 New Orleans Saints quarterback Drew Brees reveals how he celebrated his 40th birthday. 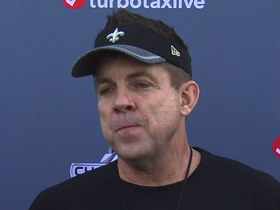 New Orleans Saints head coach Sean Payton details how his relationship with quarterback Drew Brees has evolved since 2009. NFL Network's Deion Sanders ranks the remaining quarterbacks playing in the playoffs in the championship round. 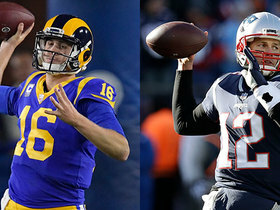 NFL Network's Deion Sanders and Maurice Jones-Drew debate which quarterback matchup they want to see in the Super Bowl. The New Orleans Saints take the late lead on wide receiver Michael Thomas' stellar 2-yard touchdown catch near the pylon. New Orleans Saints quarterback Drew Brees hits his wide receiver Ted Ginn for 25 yards on a crucial third down.